In Animal Weapons, Doug Emlen takes us outside the lab and deep into the forests and jungles where he's been studying animal weapons in nature for years, to explain the processes behind the most intriguing and curious examples of extreme animal weapons—fish with mouths larger than their bodies and bugs whose heads are so packed with muscle they don't have room for eyes. As singular and strange as some of the weapons we encounter on these pages are, we learn that similar factors set their evolution in motion. Emlen uses these patterns to draw parallels to the way we humans develop and employ our own weapons, and have since battle began. He looks at everything from our armor and camouflage to the evolution of the rifle and the structures human populations have built across different regions and eras to protect their homes and communities. 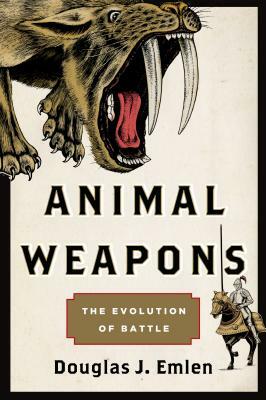 With stunning black and white drawings and gorgeous color illustrations of these concepts at work, Animal Weapons brings us the complete story of how weapons reach their most outsized, dramatic potential, and what the results we witness in the animal world can tell us about our own relationship with weapons of all kinds. Douglas J. Emlen is the recipient of the Presidential Early Career Award in Science and Engineering from the Office of Science and Technology Policy at the White House, multiple research awards from the National Science Foundation, including their five-year CAREER award, and a Young Investigator Prize and the E. O. Wilson Naturalist Award from the American Society of Naturalists. His research has been featured in outlets including the New York Times and National Public Radio’s Fresh Air. He is a professor at the University of Montana. David J. Tuss is a graphic artist who specializes in blending technical accuracy with vivid, lifelike compositions. His work is also featured in textbooks, scientific articles, and technical biology papers. He lives in Helena, Montana, where he works as a wilderness ranger, natural science illustrator, and public school science and art teacher.